If you can juggle two balls in your right hand, and juggle two balls in your left hand, then you are able to do 4 ball juggling, which is just doing both tricks at the same time! It may be helpful to have 2 balls which are one colour and 2 balls which are another colour, so that you can make sure that the balls do not cross over to the other hand! The same rule applies for any even number of objects you care to juggle (eg 6 balls is 3 ball juggling in each hand, 8 clubs is 4 clubs in each hand etc). 4 ball juggling should start with learning some 2 in one hand tricks. Take time to practice the following tricks, especially using your weaker hand! 2 Balls Clockwise and Anti-Clockwise There are a number of two in one hand tricks that you should practice. Practice throwing the two balls in an anti-clockwise motion, then practice throwing in a clockwise direction. 2 Ball Columns Columns: Throw one ball up, move your hand across and throw the next ball up, then return your hand to catch and throw the first ball and then catch and throw the second ball. Each ball is going up and down in it €™s own straight line, just like an elevator/lift! Synchronous Throws Throw a ball from each hand at the same time with an inward scoop so that the balls circle outwards. As they peak, throw the next two up. Then just keep going! Out of Synch Throws This is harder than synchronous throws, as you have much more to concentrate on. 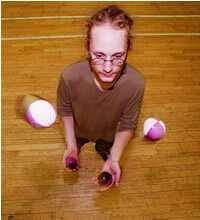 You are still juggling two balls in each hand, but throwing from each hand at a different time. This pattern is much faster, and remember that the balls should keep to the same hand (until you are ready for some tricks)! (c) Aidan J Burns – thanks! Clockwise / Anti-Clockwise You can now try throwing the balls so that they each go in the same direction (eg both hands are doing clockwise rotations). If possible, try using different coloured balls/beanbags (eg two red balls in one hand and two yellow in the other hand). This will help you visualise the pattern better. If you have a problem with the balls from each hand colliding, you could open a door, and place your hands at either side! Under the Leg Yes there is time to throw one under the leg! Practice with just two balls in one hand. Throw one ball extra high to give you plenty of time to raise your leg and throw the next ball underneath, then keep juggling! Practice with your weaker hand also. Once you have practiced this trick well enough, you shouldn’t have to throw the ball much higher than normal to keep this pattern going. Columns / Splits Throw a ball up from each hand, then shift both hands to the left a couple of inches, and throw the next two balls up in the air. Now go back and catch and throw the first two balls, and then move again to catch and throw the second lot of balls – and keep going! It takes a lot of effort to make this one look effortless! You could also start with each hand throwing a ball at the right side of your body, and moving your hands swiftly to throw two balls on your left side, and moving very quickly between the two! Once the balls are going up and down in their own columns, you could try slowly widening the gap! 4 Ball Half Shower My favourite 4 ball trick! You can start off by juggling this pattern synchronously (throwing a ball from each hand at the same time). Choose which direction you want the balls to go in, and at the same time, throw a ball high to one hand, and throw the ball low to the other hand. When both balls peak (which should be roughly the same time – this needs a bit of work), throw the next two balls in exactly the same way (the hand that threw a high ball, throws another high ball etc). Keep going, and remember to practice this trick in both directions! Snake Start with two balls in each hand. Throw one ball from your right hand, then two balls from your left hand in quick succession. Then throw two from your right hand in succession. (i.e. throw the one still in your hand, catch the first left, throw it, catch and hold the second left) Then two lefts, two rights, two lefts, etc. It’s confusing at first, but the pattern looks really good! Continuous Crosses Hold two balls in each hand, and throw one from each hand to the opposite hand at the same time. You need to throw one ball slightly higher than the other ball or else they will collide. Treat the incoming balls as the first throw in a 4 ball fountain and keep juggling throwing in the occasional simultaneous cross. See if you can make every throw a simultaneous cross! 3 Ball Surprise Hold 4 balls in your hand, but keep one held firmly at the back of your hand so that people think you only have 3 balls! I use my pinky and forefinger to clamp the ball in the palm of my hand). Do some 3 ball juggling tricks, keeping the 4th ball hidden, then when you have caught another ball in the same hand, throw both balls up into the pattern, then clamp down on the 4th ball again, and go back to 3 ball tricks!